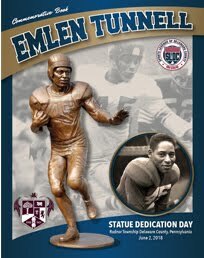 Tunnell was an outstanding all-around athlete at Radnor High School, where he was All-State in both football and basketball, and was given a scholarship to the University of Toledo to play football. As a freshman, he suffered a neck injury so severe that when he awoke in the hospital, a priest was administering Last Rites. He returned to Garrett Hill in a neck brace that he wore for several months, and was told that he would never play football again. He played basketball for Toledo instead, but like many young men during the war he wanted to enlist, but the US Army and US Navy both rejected his attempts. He was eventually accepted by the US Coast Guard, and spent two years of service there before returning to play football for the University of Iowa. ceremony at the Coast Guard Gymnasium in Alameda, California. While serving in the Coast Guard, on the night of April 27, 1944, Tunnell was aboard the cargo ship U.S.S. Etamin as it unloaded 6,000 tons of explosives and gasoline in Milne Bay at Aitape Harbor, New Guinea when it was hit by a Japanese torpedo that blew a 730 sq.ft hole in the ship’s starboard side. With the shell plating and shaft alley of Etamin ruptured, gasoline sprayed over the after part of the ship eventually causing an explosion. Machinist Mate First Class Fred Shaver, remained in the lower deck shutting down many of the ship's functions to prevent further damage, when he became engulfed in flames. He made it to the ship’s deck, covered with fire at which point Tunnell recognized "Freddie", a white man he had befriended sharing stories and sports. Tunnell, chased after Shaver, picked him up and carried him to shelter, beating out the flames with his hands. Though Shaver sustained burns over nearly 80 percent of his body, through Tunnell’s bravery, “Freddie” survived. Tunnell suffered severe burns to his hands, but wrote in his 1966 book “Footsteps of a Giant” many years later that he only did what any crew member would do. Acts of heroism are often not personalized by the people who commit them, and Tunnell later followed up his courageous act in 1946, when he, a “poor swimmer” leaped into 32 degree water to rescue his shipmate, Alfred Givens, who had fallen of the dock of the Coast Guard Cutter Tampa. He saved his drowning shipmate, but suffered exposure and shock from his 15 minutes in the icy sea. In recognition of Tunnell’s heroic actions, the commanding officer of Tampa, Cmdr. Ralph Jenkins, nominated Tunnell for the Silver Lifesaving Medal. 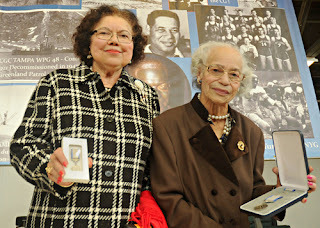 A momentous occasion considering African Americans were not customarily awarded medals at that time in our history. He would be bestowed a Combat Action Ribbon for lifesaving posthumously on March 9, 2011, and accepted by his sister Vivian and her daughter Catherine, at a ceremony to dedicate the Coast Guard gymnasium in Alameda, CA in his name. 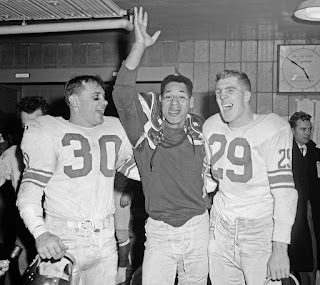 Tunnell was undrafted after college, and he began his pro career by hitchhiking across the country from Iowa to New York City to meet Jack Mara, son of Giants founder Tim Mara, and ask to try out for the team. In his Hall of Fame induction speech, Tunnell thanked the West Indian banana-truck driver who dropped him off near this Polo Grounds “appointment”. the N.F.L. 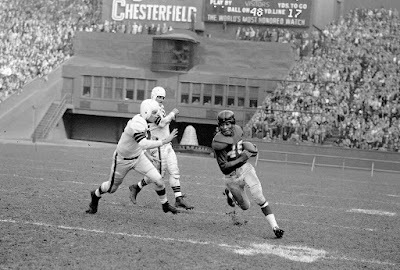 championship in 1956. 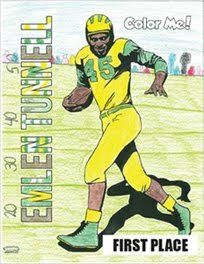 Tunnell played 14 years in the National Football League. He played his first 11 years with the New York Giants and the last three years with the Green Bay Packers. Tunnell was a nine-time Pro Bowl selection. He moved from the Giants to the Packers when Giants offensive coordinator Vince Lombardi took over the head coaching duties at Green Bay and in 1961 assisted the Packers in winning the NFL Championship against his old team, the Giants. 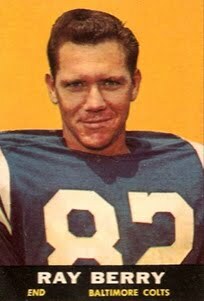 He retired after that season with a record that included leading the NFL in punt return yards twice, in 1951 and 1952 and playing a then-NFL record of 143 consecutive games. He ended his career with a record 79 interceptions (since surpassed by Paul Krause, another University of Iowa Hawkeye), which he returned for 1,282 yards and 4 touchdowns, and 16 fumble recoveries, along with another 3,506 return yards and 6 touchdowns on special teams. He was elected as the first African-American in the Pro Football Hall of Fame in 1967. 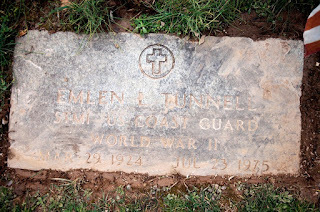 Tunnell became a scout and assistant coach with the Giants, and died from a heart attack in Pleasantville, New York during a practice session in 1975.
home in Garrett Hill, Radnor. He died of a heart attack at 50, in 1975.
heroism, his record on the field, and his accomplishments and as citizen and serviceman. For this reason, the Sports Legends Museum of Delaware County chooses to honor this man by creating a bronze statue. 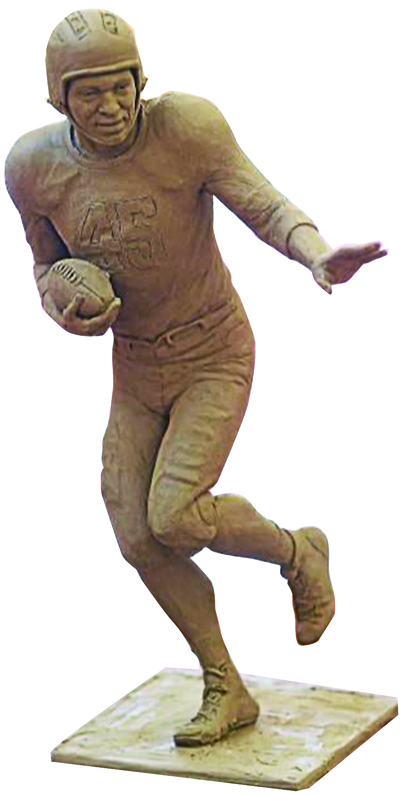 According to SLDC board member, Jim Vankoski, “Emlen represented all of the true qualities of a “sports legend.” He overcame an era of prejudice in the armed services and the sports arena and physical challenges of his injuries on the field, to stand as one of the greatest sports stars in Delaware County’s history. Tunnell was a true gentleman, admired, respected and loved by his peers, his community and his country. 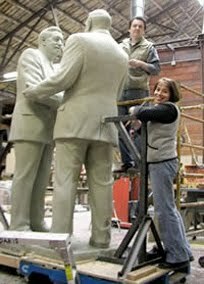 The Sports Legends Museum of Delaware County is currently raising funds to turn the model into a larger than life statue.